Our most recent event took place on July 20, 2016 at the Al Green Theatre at the JCC. It featured Dr. Robert Watson speaking on “Making Sense of the Nonsense: The 2016 American Presidential Campaign”. His talk analyzed the key moments and factors in the campaign and offered predictions on what to look for in the national party conventions, vice-presidential selections, debates and fall vote. Robert Watson also gave a brief overview of his latest book, The Nazi Titanic, the incredible untold story of a doomed ship in WWII, following which there was a book signing by the author. The event was a SELL-OUT! All who attended loved it. 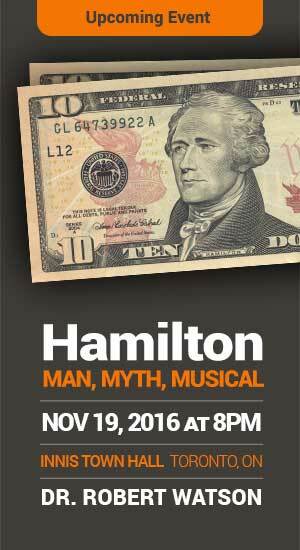 Be sure to catch Dr. Watson when he returns on November 19, 2016 to talk about “Hamilton: Man, Myth, Musical” taking place at the Innis Town Hall at the University of Toronto. Our first full day event took place on May 4, 2014, in downtown Toronto, and featured 10 outstanding Canadian and American professors presenting fascinating lectures on literature, history, music, art, science, economics and more. Our faculty consisted of the best and the brightest. Each professor was either a recipient of the prestigious 3M National Teaching Fellowship, Canada’s highest teaching award, or a finalist or winner of TVOntario’s Best Lecturer Competition. Our second event took place on April 25, 2015 at the Bram and Bluma Appel Salon at the Toronto Reference Library. It featured 6 award-winning professors from prominent universities in North America, speaking on history, science, psychology, music, film and architecture. This time, the lectures were all presented in the same hall although attendees had a choice to attend the morning session, the afternoon session or the full day. It was one day of fast-paced, engaging, stimulating ideas presented by the best minds and most entertaining speakers. Attendees had the chance to listen to a thoughtful consideration of key cultural ideas, with the chance to ask the experts their questions. A survey conducted following the event revealed that more than 75% of attendees were extremely satisfied with the event. 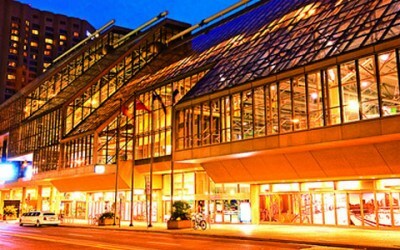 Almost 76% of attendees found that the event was either a great deal of value or a lot of value. Lots of information in a short time; eclectic topics. Excellent lectures on Hitchcock, the Blues, the US Presidency.